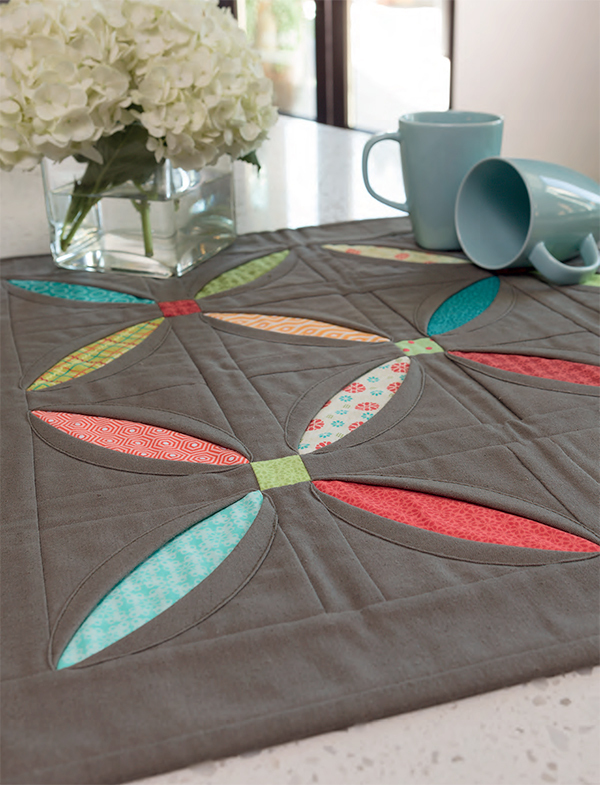 Have you tried the easy quilt-as-you-go method? 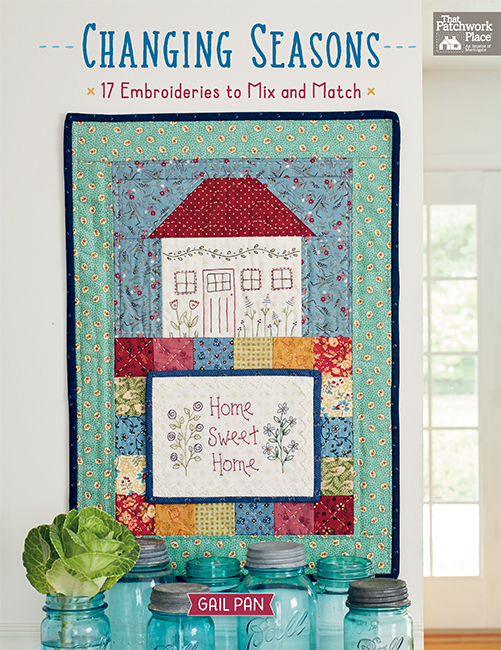 It’s packed with some serious quilting magic! You start by basting your backing and batting together; then you stitch the pieces for the patchwork on top of the batting and backing. Which means you’re machine quilting your project at the same time you’re piecing it. If you’ve never heard of the easy quilt-as-you-go method or if you’ve yet to try it, take a look at our excerpt today from Gudrun Erla’s book Learn to Quilt-As-You-Go. After she had designed patterns and owned quilt shops in her home country of Iceland, quilting brought her to Minnesota in 2003. Since then Gudrun has been designing full time, and her quilt-as-you-go technique is super-popular. You’ll see why below! Every technique starts with knowing the basics. 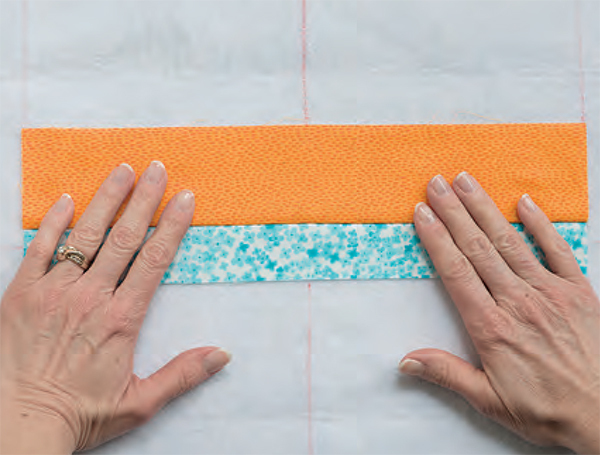 Once you understand the basic method of building a backing-and-batting sandwich and applying strips to it, you can piece and quilt your projects in a single step. 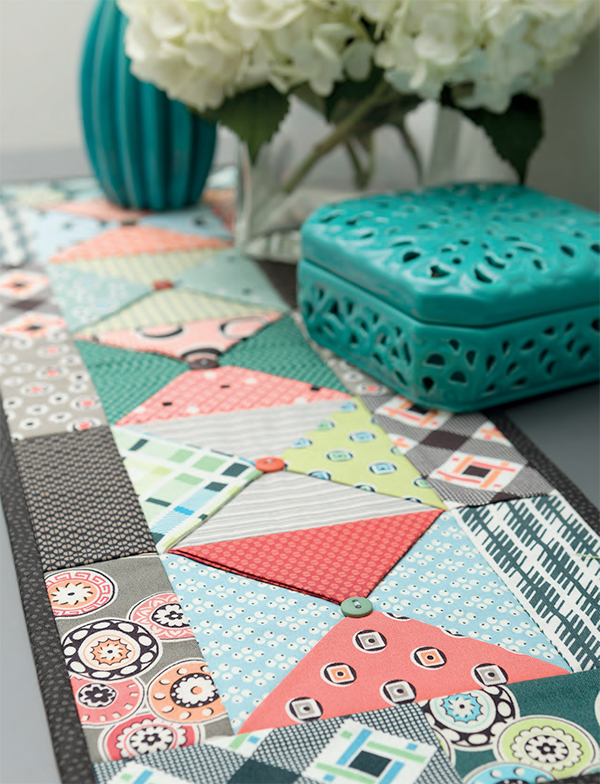 In Learn to Quilt-As-You-Go, I delve into working with triangles, filling areas with strips that go in different directions, adding appliqués and dimensional embellishments, and creating the illusion of curves. 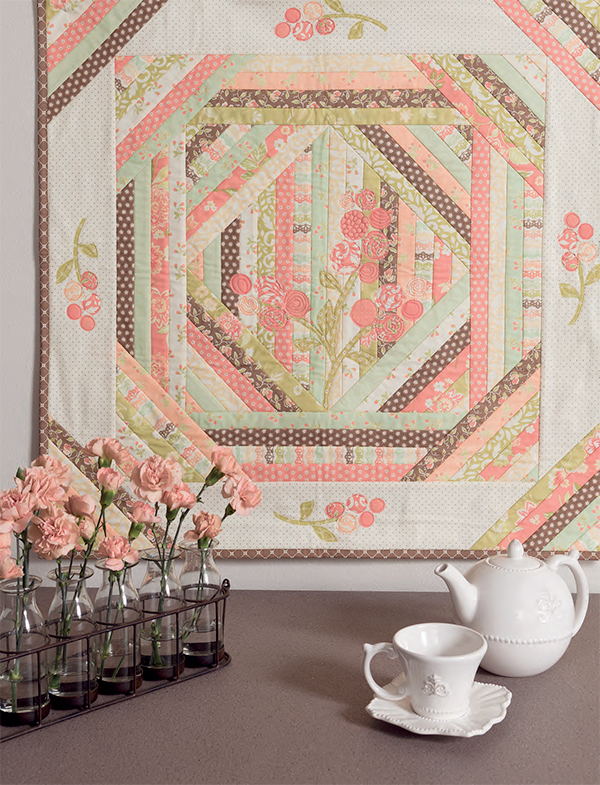 It’s a fun method to rely on for smaller projects—and when you realize the quilting is complete once you’ve sewn your last patchwork piece, you’ll be amazed! So let’s talk about the basics of this fun process. 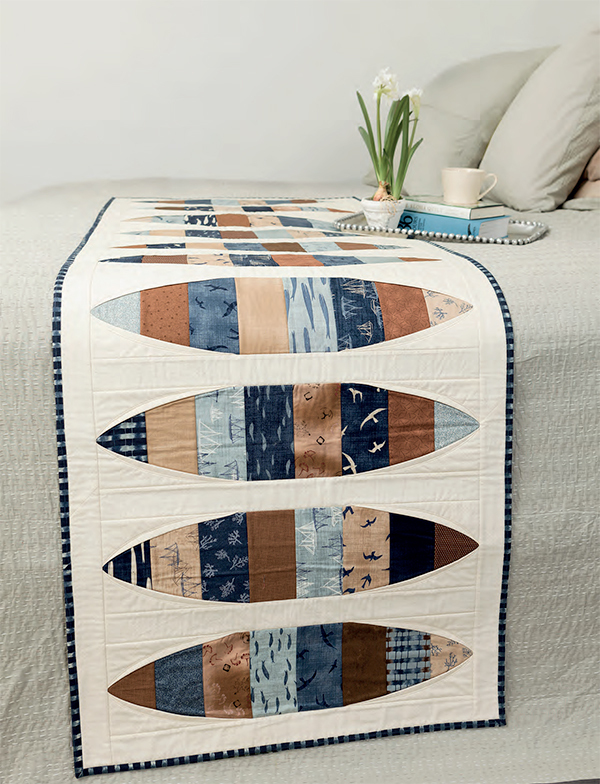 Before adding any quilt-top pieces, you first need to baste the backing and batting together. 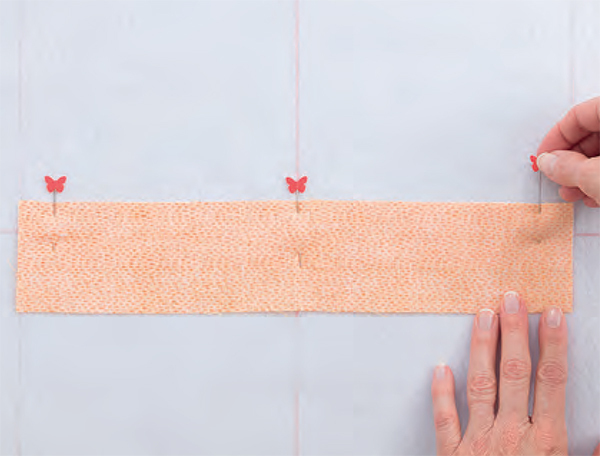 There are several ways you can do this, but whatever method you use, make sure there aren’t any puckers or wrinkles on the backing before you begin piecing. My preference is to use fusible batting or interfacing and then fuse the backing and batting together. You can also use nonfusible batting with basting spray, quilter’s safety pins, or thread. Once the backing and batting are basted together, you’ll need to mark the batting to use as a guide for placing the fabric pieces. Each project in the book specifies how to mark the batting. 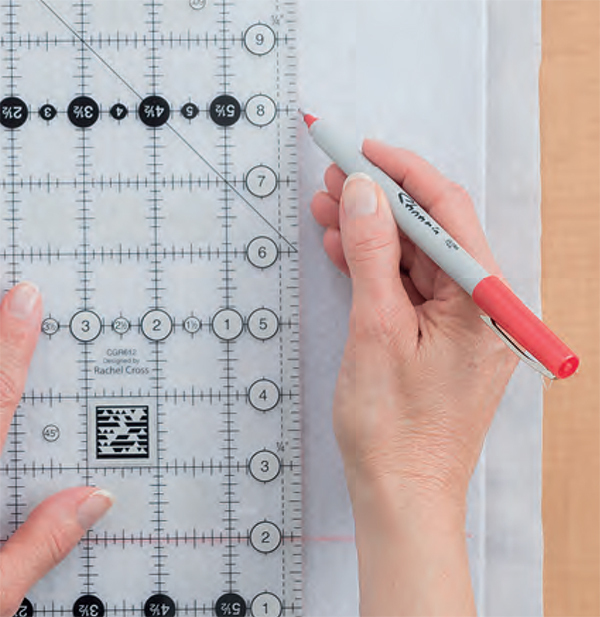 Use a clear ruler and a marking pen or pencil to mark accurate lines that are easy to see. Your fabrics are cut, the backing and batting are basted together, and your machine is ready to sew. It’s time to quilt as you go! Place the first fabric right side up on the batting where instructed, using the lines on the batting as a guide. Position the next piece over the first strip, right sides together, aligning the raw edges along the edge indicated in the project instructions. Pin the pieces together. 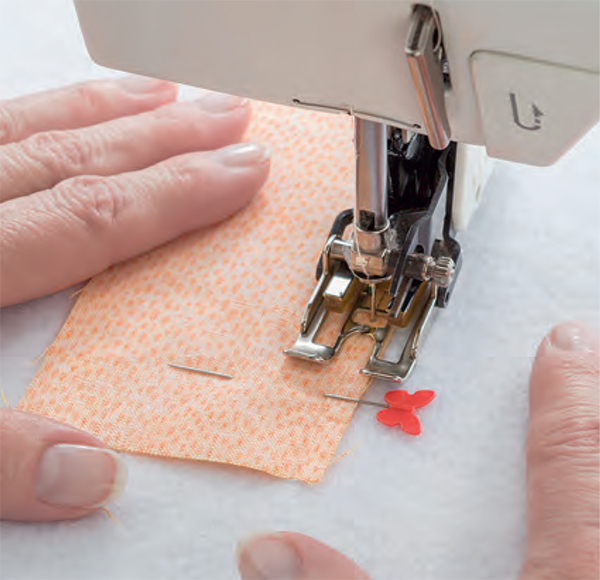 Using a ¼" seam allowance, sew through all the layers, remembering to lock your stitches at the beginning and end of the seam. With your fingers, open the second piece to the right side and finger-press the seam. Then use an iron to press the unit. Try to avoid directly touching the iron to the batting so as not to melt it. For some projects I simply finger-press each piece as I sew, and then press with an iron after I’ve completed a full row. Use your best judgment and go to the iron if you feel like your pieces aren’t lying flat with just finger-pressing. Lay the next piece in place as directed in the project instructions and pin it in place. Sew through all the layers, and press as before. Continue in this manner until all the pieces have been added. What’s next? The binding—other than that final step, you’re done! 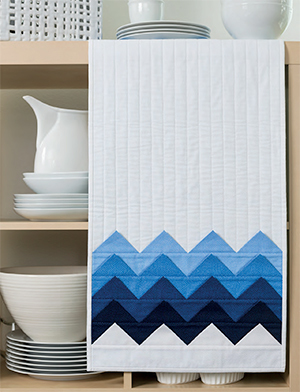 What’s your experience with quilt-as-you-go: love it, learning it, or haven’t yet tried it? Tell us in the comments! Its something I have looked up several times but that I still have not tried. 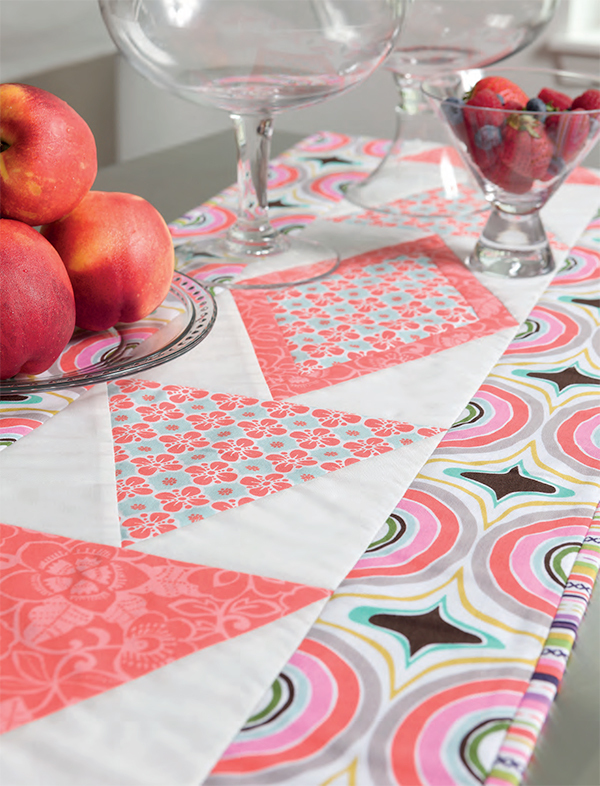 I have done some quilt as you go, table runners and placemats, but these patterns all look great. Especially like Spring Bouquet. Table runners, raggedy quilts, potholders (actually recovering old ones!) and I did a dolly quilt this way, haven’t tried bigger projects… recently I was doing some crumb quilting and remembered my potholders and have done a couple of experiments. I love quilt as you go! I’ve done some QAYG and really like using it, especially for small projects, and for applique projects. This looks like a good book to have. I haven’t tried it yet but would love to give it a whirl. I’ve only done QAYG with my guild making quilts to give to wounded warriors in our county. But I LOVE Gudrun’s Stripology rulers so I KNOW this will be a great book to tackle some more lovely QYAG! I haven’t’ tried it yet. This sounds easier than what I have read before and I think I understand it better. 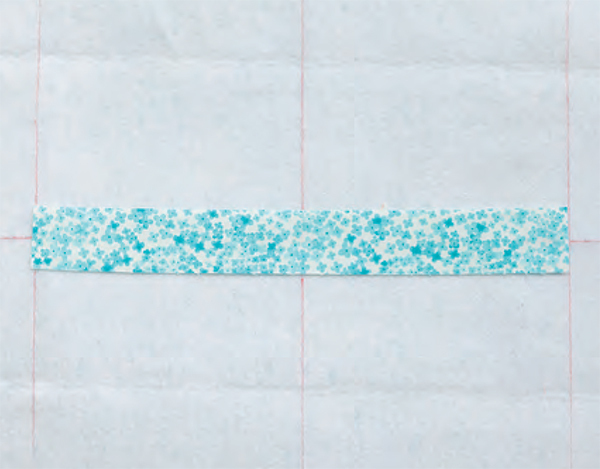 Over 30 years ago I thought I was inventing QAYG when I made placemats with varied size strips placed on the diagonal. I had never seen anything about it in the literature back then. Maybe I was ahead of the time! I made a queen sized quilt as my first try. It was great to have it finished so quickly. It is great to do a project for kids because they are rough of quilts. My grandchildren loved the quilt. Small projects would be easier. My guild had me teach the class and several of them made the same quilt. Have tried on a runner like the first one pictured. I all ready have finished blocks for another quilt, am going to try quilting each individually and then joining together. Hope to get the book soon. I have done a large quilt and many placemats etc. in the quilt as you go. They turn out nice, but I do most of my tops regular piecing. The book looks very interesting and would give some new ideas. I have done several using this technique. It is rather fun. I love the concept of QAYG. I am definitely still learning. I have done quilt as you go a couple times, but it was a long time ago. The table runners look very attractive and I would love to try it again. I haven’t tried quilt as you go yet but I am really interested. I am "learning to love it". I have tried it a couple of times and plan to keep using it to quilt smaller projects with more "fancy" quilting. This is not a method I have tried yet, but intend to soon! 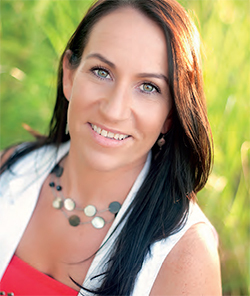 Such lovely offerings to view in this post along with good tips, thanks! When making baby quilts with minky, I always quilt as I go! Make the quilt quick and perfect for mothers because they will use the quilt. Learning it. I made a place mat so far but not a quilt as yet. I have made a set of place mats using quilt-as-you-go. I’ve done one quilt with the quilt-as-you-go method, but looking at Gudrun’s Spring Bouquet Wall Hanging, I’m inspired to do more! efforts so far – but I will keep trying. I have done it a few times for small projects and when I am in hurry. I have made a few quilts using the quilt-as-you-go method. I definitely could become more proficient in this. Definitely want to get this book and try this method. Have read about it before but didn’t have a good reference from which to work. What a time saver! When you just aren’t an artistic free motion quilter, this technique would be terrific. Can also see a lot of advantage to using this method for things such as place mats that will end up being washed frequently. I love quilt as you go for my big wuilts. Although I do it by a different method. I make all my blocks first, the layer & quilt in sections. Add the sections with or without sashing. Bind. I used QAYG a long time ago for a wallhanging. Loved the process and the results! 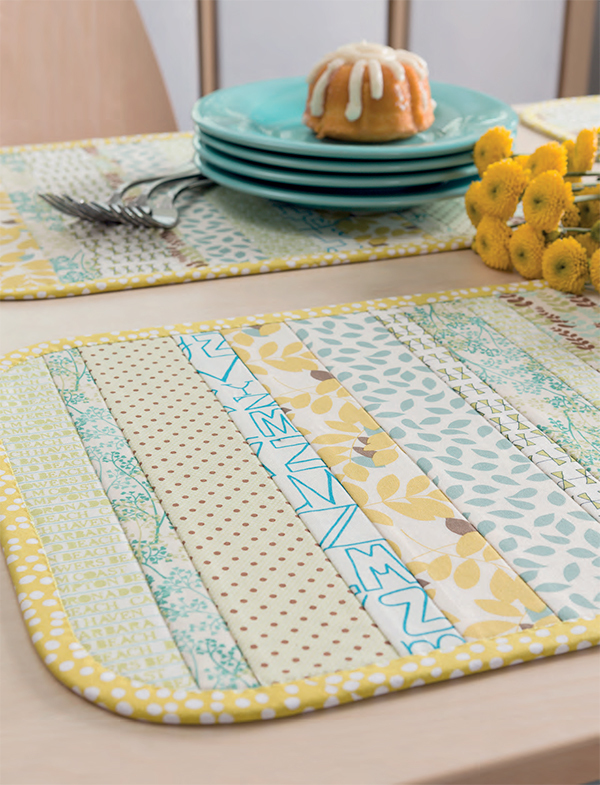 It would’ve a great way to make placemats, table runners and other things that need frequent washing. Haven’t tried it – but I love the look of it. I have never done a quilt as you go I’ve been a little afraid of it! One of the first techniques I learnt. Haven’t done it in many years. Often think about it. I haven’t done a QAYG project even though I have had a book on this technique for several years. Can you say "chicken"? Many times I’ve wanted to give it a go on small projects like placemats, but I always go back to the tried and true. Did it a long time ago with Georgia Bonesteel. It was convenient, but I don’t like it as much as regular machine quilting. I’ve never tried QAYG, but would love to try it. I am somewhat familiar with Quilt As You Go. I made two beautiful Table Runners this year. One for my granddaughter for Christmas and the other for me. I never seem to make anything for myself. I plan on making a few more out of that table runner design done with a center on point and strips after that. Great pattern. 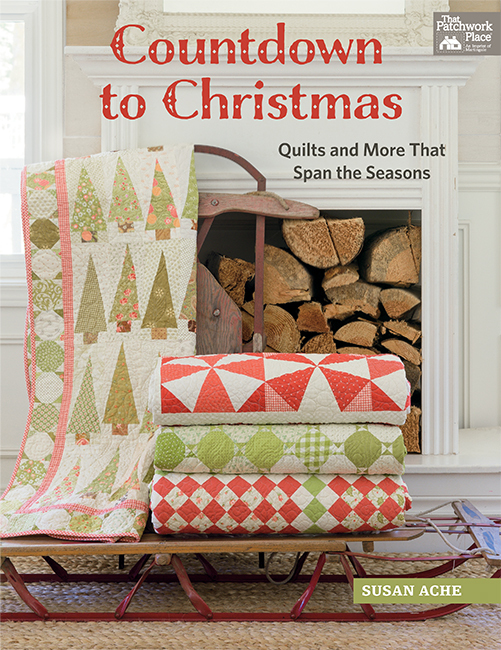 Would love to own that book for more Quilt As You Go fun! I have not tried this method od quilt as you go. I have heard avbout quilt as you go,but did not know how to do so now I do would try on a small project first. I have never used the quilt-as-you-go method, but I’m very open to beginner projects to learn a new technique! I’ve only tried it once or twice and loved it! Would love to do it again sometime soon! 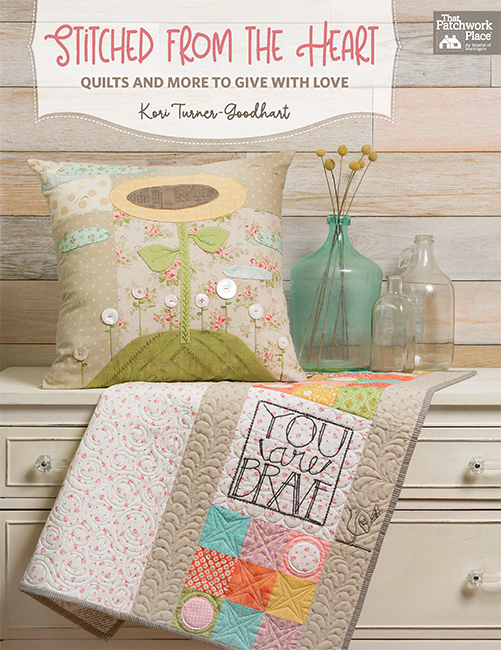 I love quilt as you go! As a beginner quilter, I find that I can even try a complicated pattern with good results. I haven’t tried it yet but would love to learn. Have looked at this a few times but hav’nt tried it yet. Would love to learn more.i particularly love the Spring Bouquet.